Perfectly mixed concrete delivered when and where you want it. 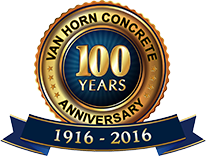 Save yourself time and money by depending on Van Horn Concrete to deliver perfectly formulated ready mix concrete. Have your concrete delivered in any volume, where you need it, when you need it and with far less hassle. You will always speak directly to our dispatchers who will not only take your order, but will batch the truck with concrete before sending it to your job. Whether your project is residential, commercial, industrial, or municipal, we’re suited to the task. Call 248-623-6000 (Waterford) or 248-332-9169 (Auburn Hills) to place your ready mix order. Click concrete calculator or call dispatch, we’d be happy to help you figure out what you’ll need!